UGOCHINYELU ANIDI is a blogger I connected with when I wrote my first children’s book Yetunde: The Life and Times of a Yoruba Girl in London (1). Every now and then, I stop by her blog to check out what she’s up to. It was on one such visit that I came upon her review of No! Don’t Touch Me There. I feel the book has a very powerful message and I just had to share Ugo’s review. In this book, Ada and Ade familiarize themselves with parts of their bodies, especially those parts that should be private and should not be touched by other people. They learn about boundaries and what to do when someone tries to cross or crosses those boundaries by trying to touch or touching them inappropriately, especially when this improper behaviour is accompanied by a request for secrecy, gifts or a threat. They learn to shout, “Noooooooooooooooo!! !” in the face of inappropriate behaviour, to protect themselves when their parents cannot. UP: Sadly, child molestation is a pervasive ill in our society and it thrives because of lack of information, shame and fear. This book tries to protect our little angels by giving them the tools to protect themselves when we can’t. It teaches children from age 1 about the sanctity of the human body. It empowers them to protect themselves by protecting their bodies, calling out any improper behaviour and speaking to a trusted adult immediately in spite of threats, gifts and oaths of secrecy. It shows them what to do when a threat is imminent. It is a treasure for mothers of girls AND boys aged 1 and above. The title is quite catchy and just perfect! THIS BOOK IS A MUST READ FOR ALL PARENTS AND CHILDREN BELOW 8. DOWN: Sometimes, molestation involves, making the victim touch or do other inappropriate things to the aggressor. I feel this important aspect wasn’t properly addressed in the book. ‘No! 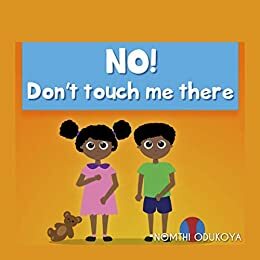 Don’t touch me there’ empowers children to confront any form of improper behaviour or abuse and gives them the confidence to talk to trusted adults. Child sexual assault and molestation continues to be a bane in our society, and it is important that responsible adults and institutions work together to strategize and develop tools that will keep our children safe. This is an important book for all children to read, it is pioneering, practical and child-friendly and will resonate with children for a long time. This entry was posted in Children's Corner and tagged book review, child abuse, children's book, No! Don't Touch Me There, No! Don't Touch Me There by nomthi odukoya, nomthi odukoya. Bookmark the permalink. ← Looking for things to do with your toddler? You should tie and dye!